The Real Time Crime Center in St. Louis. In a dimly lit room that resembles a college lecture hall, some five St. Louis police officers stare at a wall of screens. They watch through cameras perched on stop lights or lamp posts as people cross intersections or convene at parks. 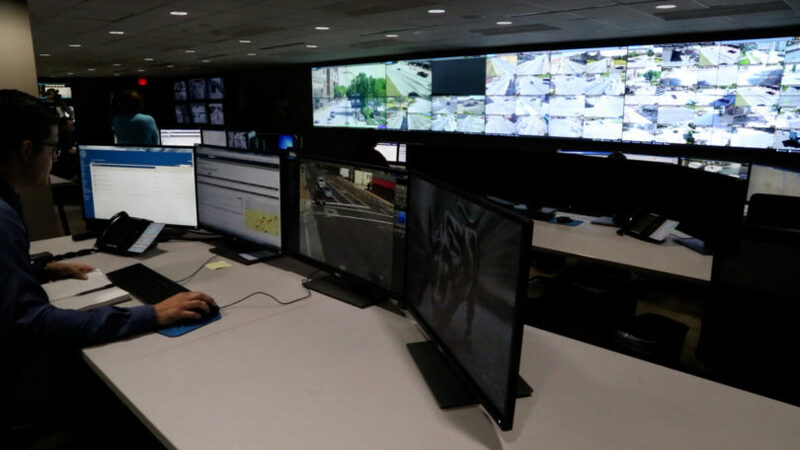 Using controls at their computers, the officers can zoom in to identify people’s faces more than a block away from the cameras. In this room, the officers monitor about 600 surveillance cameras citywide, as well as license plate reader cameras, sensors that can detect and locate gunfire, and three surveillance trailers that move throughout the city. Despite repeated requests for information, the department declined to produce any portion of the internal documentation required by its own current policy on sharing the center’s information, making it impossible to know if it is adhering to its own rules. There have been concerns over violations of citizens’ privacy at the RTCC for years. When the American Civil Liberties Union of Missouri (ACLU) learned that the police department was planning on opening the surveillance center four years ago, the ACLU warned that if the city wanted taxpayers to fund the center, it needed to establish rigorous policies to protect citizens’ privacy first. Studies have found that surveillance technology appears to be targeting communities of color throughout the country. Perhaps more than any other city, advocates believe that St. Louis – a city that has garnered the national spotlight for racial disparities in policing – should be putting its surveillance programs under a rigorous and public review for racial bias and targeting. Two months before the RTCC opened in May 2015, the mayor’s office drafted a policy to establish who has access to the surveillance information and how it’s stored. The city’s operations director asked the police department to write its own policy – in accordance with the city’s – outlining how it would regulate the use of surveillance cameras. However, the ACLU discovered that the police had drafted a more open-ended policy that didn’t align with the city’s and that set up too many opportunities for circumventing privacy protections. So, the ACLU reached out to city officials to negotiate a stronger policy. 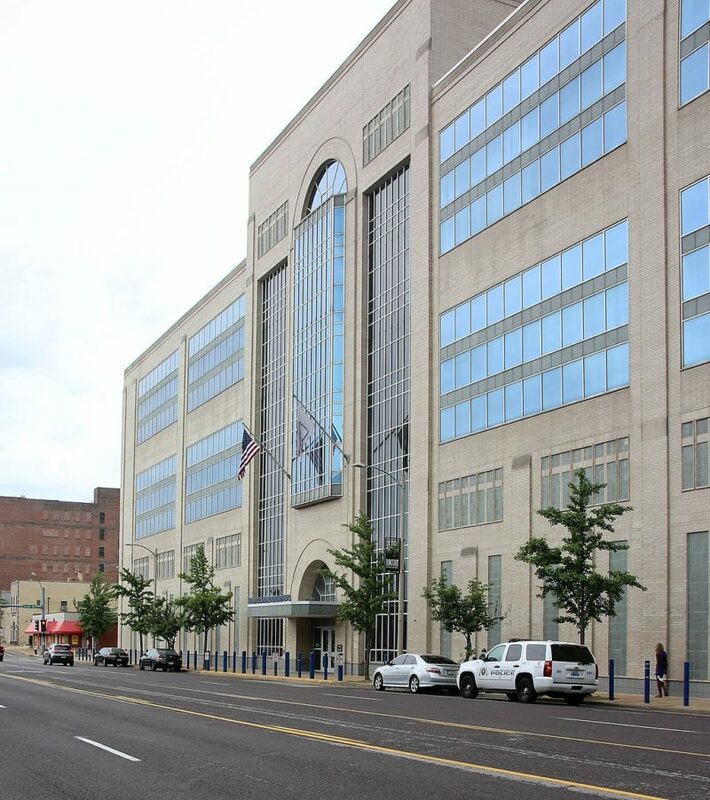 Metropolitan Police Department headquarters, St. Louis, Missouri. The ACLU and other community leaders saw several glaring problems in the police’s policy. The City of St. Louis had been asking businesses to loop their cameras into the RTCC. The ACLU believed that this private-public partnership could create some loopholes in regulating privacy. If the private entities were storing the video files, police officers could just get access to that tape without a warrant whenever they wanted, potentially bypassing any internal request process or official log, Chasnoff said. The police’s policy stated that representatives from cooperating agencies – such as business districts – could see the center’s data with the police chief’s approval. This leniency was not permitted in the city’s policy. The ACLU also wanted to see stricter login requirements for employees who had access to the information to better track and audit why they were accessing the footage. Chasnoff also said the police policy is too loosely written around how officers can use their specialized cameras. These “pan-tilt-zoom” cameras allow officers to scan an area and zoom in far distances. Under the city’s policy, officers cannot focus the cameras on individuals unless there is a “reasonable suspicion of criminal activity.” The police policy does not limit the officers in this way. The ACLU also wanted to prohibit police officers from tracking people across the city using multiple cameras if the individuals were not suspected of criminal activity. This is not stated in either the police or city policies. Mittman questioned automated license plate readers and the information they gather. These are high-speed cameras mounted on light poles and on police cars. They continuously scan and record the license plates of every passing car. According to police, if the cameras register a car that is associated with someone wanted for a violent crime, a police officer is dispatched. However, Mittman was concerned that they are also collecting data about innocent motorists and their whereabouts, which could easily be abused. “It does not make sense to have all automatic license plate readers turned on at all times, collecting data on every single individual’s movements, and then keeping that data in perpetuity and allowing anyone to go in and say, ‘Hey, I just split up with my boyfriend, I want to find out where he was,’” Mittman said. Then-city counselor Winston Calvert heard the ACLU’s concerns and set up a meeting with city officials and the ACLU in April 2015. “My experience with John has been, if he’s concerned about it, it’s probably a legitimate concern,” Calvert said. Present were the city’s Director of Operations Todd Waelterman, then-mayor's assistant Patrick Brown, Calvert and ACLU leaders, according to an email from Calvert setting up the meeting. Two representatives from the RTCC, 6th Ward Alderwoman Christine Ingrassia and the city’s Commissioner of Traffic Deanna Venker were later brought into the conversation as well, Chasnoff said. According to Chasnoff, after about 10 months, the committee seemed to be “within inches” of finalizing a policy – one that addressed the ACLU’s and alderwoman’s concerns. “At that point, it just evaporated into a black hole,” he said. When Chasnoff tried to follow up with the chief and the mayor’s office, he said they pointed fingers at each other, saying that it was on the other one’s desk. That was in the spring 2016 – more than two years ago. The mayor’s office did not return the American’s request for comment about the meetings. To get a better understanding of the police’s stance on privacy issues, the American requested a tour of the crime center. While Public Safety Director Jimmie Edwards granted the tour, it was just the beginning of a long, fruitless effort to learn what, if anything, is being done to safeguard citizens’ privacy. On May 23, the RTCC’s commander Lt. Brent Feig gave a 30-minute tour to about a dozen members of the local media. 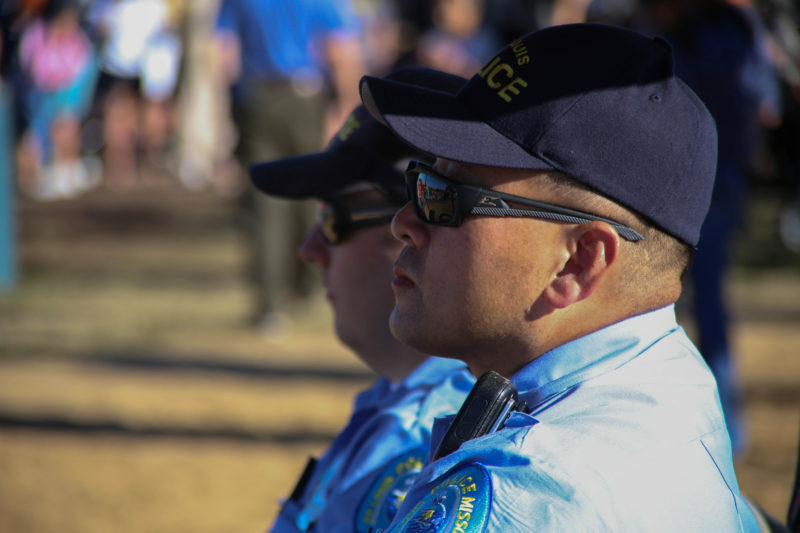 Feig touted their success in achieving the center’s goals – use of the high-definition video for quick facial recognition and quick capture of criminals and providing more “situational awareness” for officers on the street. “If we can give them some reactionary time, the better we increase their safety,” Feig said. While Feig couldn’t say if the center prevents crime, he said that its license plate recognition technology has been responsible for more than 600 felony arrests – which were focused on capturing violent-crime offenders, Feig said. The American asked Feig how many Sunshine Law requests the center receives for access to surveillance data. The American followed Addo’s advice andsubmitted a Sunshine request on July 10 to find out who has been accessing the city’s surveillance information. According to the police’s policy, individuals – including “media, public, police fire and various criminal justice personnel” – can request the center’s information via emails, letters, facsimiles and subpoenas. And the requests are then subject to approval by the RTCC commander, Feig, or a designee. The American asked for this record of requests. However on Aug. 20, the police department responded that the request was “submitted too broadly.” The American asked the custodian of records if we could talk about how to make the request clearer, and the police, in effect, instructed us to blindly try again. On Aug. 31, the American requested to meet with Public Safety Director Jimmie Edwards to seek help in obtaining the public information and got a meeting five weeks later, on Oct. 5. The American explained that police policy mandates that all requests for information be documented, and we would like to see that record of requests. Edwards then said he suspected that if homicide officers asked to look at some footage, they are going to be given access to it – and that’s not going to be documented. At the end of that meeting, Edwards said that he would provide logs of the requests – both requests that came from outside and within the police department. The department did not provide a redacted copy of these records that blacked out the names of victims and officers, which is often done when the public requests police records. On Sept. 21, the American requested to interview Feig – who has been in charge of the center since it opened – regarding how the center approves access to the footage, seeing that no documents were provided to demonstrate this. The department denied the request, stating that “most, if not all, of your questions were answered” during the May 23 tour and that they provided additional information through our Sunshine requests. According to the police department, the crime center assisted in making 716 arrests, resulting in 1,912 charges from June 2015 to July 2, 2018. The American also requested to view all of the center’s expenditures. We were given the crime center’s budget for fiscal year 2018 of about $524,400, and for FY2019 of about $535,300, which included mainly salaries and a small amount for supplies. Yet this was far from the only funds going into the center, we learned. We obtained copies of the police department’s capital requests for fiscal year 2018, which city Budget Director Paul Payne explained are requests to buy things like equipment vehicles. We followed up and asked again if this equipment was purchased by any means at all, including grants, ward funds or donations. The police responded that two mobile trailers were donated by the St. Louis Police Foundation in 2018, adding to the trailer that they received from grant funding in 2017. About 109 surveillance cameras were added through the City of St. Louis during 2018, a department spokeswoman said, through Ward capital funds and donations. The RTCC has not had a video wall expansion since 2017, the spokeswoman said. This past spring, the American learned that two African-American aldermen were picking up the torch and drafting an ordinance that addresses community leaders’ long-held concerns. Aldermen Terry Kennedy (D-Ward 18) and John Collins-Muhammad (D-Ward 21) had attempted to do this once before in 2017, but that bill never made it to a committee hearing. Privacy advocates believe the Surveillance Technology Bill that Kennedy and Collins-Muhammad introduced on Jan. 11 could help address these concerns. The bill would require any city entity that operates a surveillance program – including using street cameras, body cameras, automatic license plate readers, and facial and voice recognition programs – to present an in-depth plan to the Board of Aldermen, as well as annual accountability reports. It would mainly apply to the police, Street Department and business districts. The aldermanic Public Safety Committee will hold a hearing on the bill on Thursday, Jan. 24 at 11 a.m.in the Kennedy Room at City Hall. Under the bill, equipment purchases, Sunshine Law requests, and breakdown of arrests and crime reduction must be documented and submitted in an annual report to the aldermen and Public Safety director – and it’s a public record that must be given within five days of a request. The bill proposes that aldermen would hold public hearings to hear feedback from the community about any proposed surveillance technology. Currently the public doesn’t have a voice in the matter. In St. Louis, the police have the power to decide “unilaterally and in secret if and how they are going to use these technologies,” said Chad Marlow, senior advocacy and policy counsel for the national ACLU. If the St. Louis Board of Aldermen passes the bill, St. Louis will become the tenth city – as well as a county and a large urban transportation district – to pass similar bills throughout the country, Marlow said. The ACLU has been leading these efforts and providing a legislative template. “My biggest concern when I look at St. Louis is racial disparities in policing,” Marlow said. As part of the bill, those wanting to implement surveillance equipment would have to explain how they will avoid being biased and targeting certain communities. Then every year they have to report any “discriminatory, disparate, and other adverse impacts” the technologies have had on people’s civil rights. “When you know that you have a city that has racial disparities in policing – and that is absolutely the case in St. Louis – and when you know the use of surveillance technologies in general when they have been used throughout the country are deployed in ways that are racially biased, you certainly don’t want to marry those two things,” Marlow said. Marlow pointed to several cities that appear to have targeted communities of color with surveillance technologies. In Baltimore, advocacy groups filed a legal complaint alleging the Baltimore Police Department is violating federal laws by using cell site simulators, also known as Stingrays, that disrupt cellphone calls and interfere with the cellular network—and is doing so almost exclusively in black neighborhoods. In Oakland, California, drivers are less likely to be picked up by automatic license plate readers if they are driving through or parking their cars in a neighborhood with a higher density of white families, according to data analysis by the Electronic Frontier Foundation. In Lansing, Michigan, African Americans were twice as likely to be under camera surveillance as white residents, according to a study by an Oakland University researcher. Black Lansing residents were subject to disproportionate scrutiny of their personal houseguests and yard activities and undue exposure to round-the-clock surveillance. This is why the ACLU believes that residents need to be part of the discussion around surveillance.